Let’s resume from #1 (the Major Scale). We know that the scale pattern here is WT WT HT WT WT WT HT, also called “Ionian”. If we create a scale starting on the second note D, but keep using the C major notes, we get D, E, F, G, A, B, C, D. Of course the scale pattern also changes because everything moves one step to the right. The resulting pattern is: WT HT WT WT WT HT WT. Thus we now have a new mode – “Dorian”. 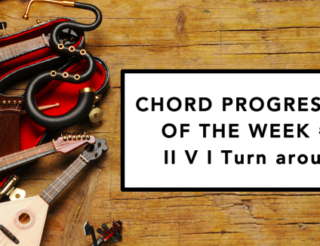 Let’s continue going up the scale, creating new sequences by starting on different notes of the C major scale. Each of the resulting scales has its music mode (also called church modes) and specific scale pattern. Here is a list of all of them. 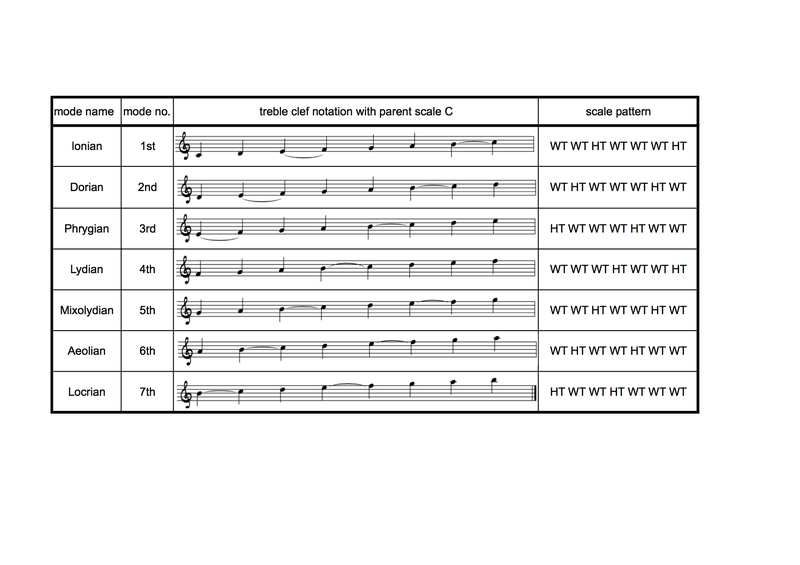 In this example, all the listed modes share the same ‘parent scale’ – C major. 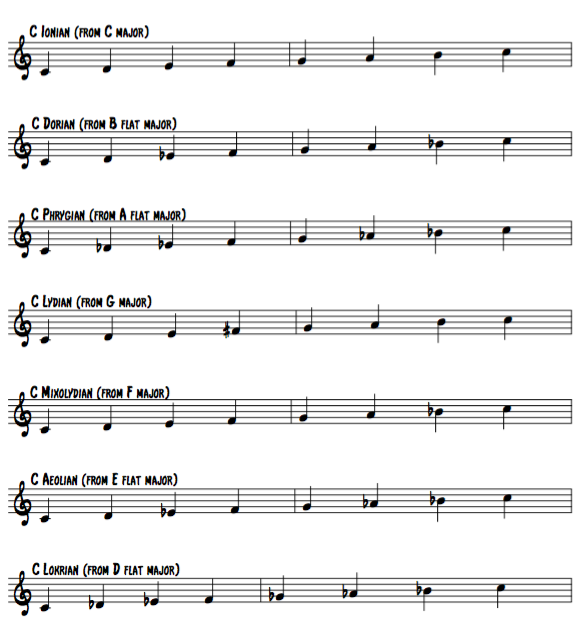 Some music modes are more commonly used than others, and each has its distinct sound. Let’s have a look at them. Click on the title to hear what each mode sounds like. Some modes are more commonly used than others, and each has its distinct sound. Ionian: probably the most common mode. Any Song in any major key is in Ionian mode. Dorian: is a minor mode (minor third between first and third degree). Sounds faintly jazzy. A couple of famous songs from the golden Jazz era featured the dorian mode quite prominently. This was when so-called “modal” approach became popular with Miles Davis’s “So What”. It is the parallel mode to Lydian. Phrygian: also a minor mode. It is one of two modes with a minor 2nd step and has a somewhat latin sound. Lydian: like Ionian but with a sharp 4th step. Parallel to Dorian. Mixolydian: a major mode with a flat 7th step. The Blues mode! Aeolian: the “standard” minor mode. Considered parallel to the Ionian mode. Locrian: the only mode with no perfect fifth in it. It also contains a minor 2nd step. 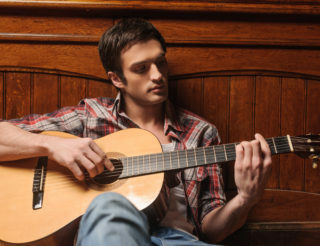 Let’s take a risk here and say the most common of these are: Ionian, Dorian, Lydian, Mixolydian and Aeolian. 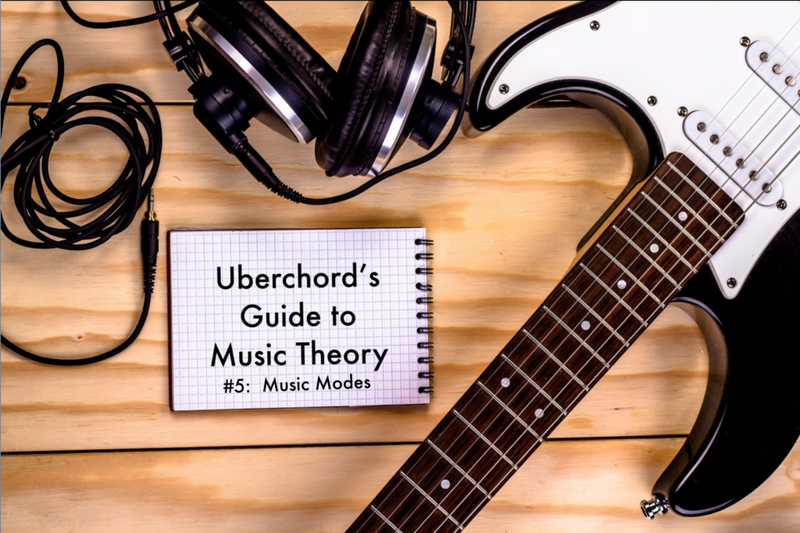 Use all the music modes in the order above, starting with the note C. This means: our ‘parent scale root’ shifts across the chromatic scale and we end up using a different key for each mode. C Ionian will be the C major scale. No accidentals. C Dorian refers to the Bb major scale of which C is the 2nd degree. Bb major has two flats; Bb and Eb. So we end up with this: C, D, Eb, F, G, A, Bb. For C Phrygian we have to make the starting note C the 3rd degree, so the parent major key moves to Ab with 4 flats: Ab, Bb, Db, Eb. So C Phrygian goes: C, Db, Eb, F, G, Ab, Bb. C Lydian is almost the same as Ionian, with the exception that the fourth moves up a half tone to F#. The corresponding parent major scale is G, of which C is the 4th degree. C Mixolydian is also close to Ionian. The only difference is the seventh, which moves down a halftone from B to Bb. This comes from the parent major scale F, C being the 5th degree. C Aeolian makes C the 6th degree of its parent scale. That brings us to parent scale Eb major, with Eb, Ab and Bb.C Locrian is perhaps the weirdest one. The parent major scale is Db of which C is the 7th degree. Loads of flats here: C, Db, Eb, F Gb, Ab, Bb. Want to become a keys-and-modes expert? Repeat this practice exercise starting on any note! One last very important piece of information. Suppose we have a Blues in C – a C Mixolydian mode featuring one accidental Bb, we would still use the key signature of C major. Why? Because key signatures only refer to major (Ionian) or minor (Aeolian)! We have to admit that this sometimes may not make so much sense, but it has become so common that there’s absolutely no point in questioning it. 1, b3, 4, b5 (blue note). Db, Fb (E), Gb and Abb (an A with two flats, or G). 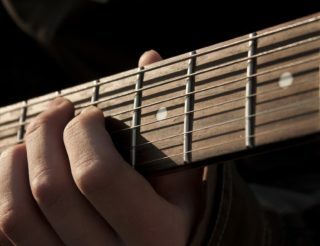 C#minor however, has no major third F which is essential for the Mixolydian mode. This is a very special case due to Blues melodicism, which will be covered in a later issue.